Combining the Open Computing Language (OpenCL™) programming model with Altera’s massively parallel FPGA architecture provides a powerful solution for system acceleration. 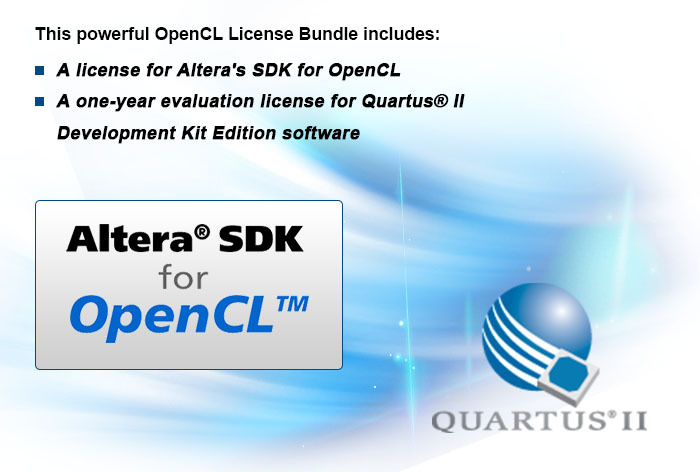 The Altera® SDK for OpenCL* provides a design environment for you to easily implement OpenCL applications on FPGAs. Altera’s Quartus® II software is the industry's number one software in productivity and performance for CPLD, FPGA, and SoC designs. This product can only be purchased with DE5-Net / DE5a-Net board as an accessory.